Whether you are missing one tooth or multiple teeth, dental implants may be a viable solution for restoring your natural smile. Patients must have healthy gums and adequate bone to support the implant. The patient must also be committed to good oral hygiene, including exceptional brushing, flossing and regular visits to our San Jose office. Whether your tooth loss is caused by decay, years of wear and tear or serious trauma, dental implants can help you get your smile back. 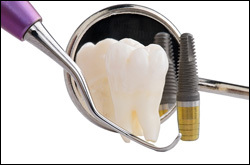 No other restorative procedure replaces the entire missing tooth and preserves bone like dental implants. If you're missing teeth, don't compromise your health and quality of life any longer. Visit The Dental Dimensions and find out if dental implants are a good fit for you.